The City of Goodyear has a 500,000 gallons-per-day brine problem. That problem will only grow as the quiet little West Valley city along the Estrella Mountains expands. Goodyear is working on an innovative solution, but first let's look at the problem. What is brine? As groundwater slowly moves underground from the eastern edge of our Valley toward the west it becomes increasingly saturated with salts and other solids that must be removed before it may be delivered to municipal customers. Brine is the wastewater byproduct of treating this groundwater to drinking water quality. It is heavy in salts, metals and nitrates. Goodyear's solution: Goodyear has built the largest municipal reverse osmosis drinking water treatment plant in the state. The technology cleans the groundwater of its heavy microscopic solids by using a series of mesh screens. The leftover solids, some of them toxic, are flushed out as concentrated brine wastewater. Why Goodyear? Large Phoenix Metropolitan Area cities get most of their water supplies from the Colorado, Verde, and Salt Rivers. This "surface" water is better quality water than the groundwater available to Goodyear and treating it to drinking water standards does not create concentrated brine. Goodyear has an allotment of Colorado River water, but stores it underground because the city does not have a surface water treatment plant. The city is currently working on the funding it will need to build a surface water treatment plant and related infrastructure. The challenge: It is not easy or cheap to dispose of concentrated brine. No water agency is allowed to empty concentrated brine directly into a natural waterway because of the heavy salt concentration and toxic elements, in particular arsenic and selenium. Most solutions, such as desalination or evaporation ponds, are expensive to build and operate, consume large amounts of energy, and create environmental hazards. Right now, Goodyear mixes concentrated brine with wastewater from homes and businesses and cleans it at Goodyear’s wastewater reclamation treatment plant. The cleaned wastewater is then stored underground. The addition of concentrated brine makes cleaning wastewater a difficult and expensive process. Despite its allocation of Colorado River water, Goodyear still will need to pump some groundwater to meet future water demands. When the city reaches build out capacity, Goodyear estimates its reverse osmosis plant will produce double the amount of brine it does today, or 1 million gallons each day. 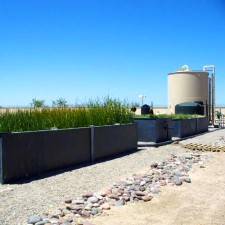 The good news: With support from the federal Bureau of Reclamation, Goodyear built a research pilot project that determined it is possible to create manmade wetlands capable of cleaning metals and nitrates out of concentrated brine. These constructed wetlands would look more like marshes and would use particular salt loving grasses and reedy plants grown in a base of wood chips and green yard waste. The brine would be piped up through different levels of terraced wetlands and grasses. The end product still would be salty water but with acceptable concentrations of metals and nitrates. It could be released into the environment after it was blended with other water to reduce its salinity. Now what? The city is in the middle of a two-year feasibility study to scale up the project. Goodyear estimates that at the time of the city’s final build out, it would need 45 acres of marshland to clean its output of brine waste. Right now the proposed acreage for the marshland is sited within Maricopa County’s Estrella Mountain Regional Park and an adjacent privately owned golf course along the south bank of the Gila River riverbed. Goodyear hopes to break ground for the project within five years. It envisions an intensely green wildlife habitat that would become a destination for hikers, bikers and birders. It would be part of a larger multi-agency wetlands and flood control project planned for the Gila River riverbed. Yes, Goodyear’s marshland is a huge project that has been a long time in the making and has a long way to go. But that’s how things get done in the world of water management. Water managers always think 20 years ahead, and often much further.